Feeding your cat is one of the tasks you must do every day. However, sometimes you may be busy or away from home but your cat will still need to be fed. What can you do in this situation? The solution is to use an automatic cat food dispenser. There are different types of cat feeders in the market. If you are buying one for the first time, there are a number of things you should keep in mind to get the right feeder. The last thing you want is to spend hundreds of dollars buying different feeders, which all end up not being good solutions for your cat. You will come across some high-priced feeders that are worth the amount they are being sold for. However, there are some expensive feeders that are cheap and will not work with your cat. To find the best feeder, do not simply look at price when shopping. You should go through customer reviews of different feeders to know their quality. Sometimes, all that glitters is not gold. You may have the best automatic cat feeder but if your pet is determined to get extra food, she will try to break it. Cats are usually obsessed with food and if you don’t teach them to respect the feeder, you should not expect it to last long. Therefore, look for a feeder that is strong and will not be easily broken. Apart from this, teach your cat from the onset to respect the feeder and discourage her from trying to break it. Some breeds like Siamese and Bengal are known to try to manipulate the units to get extra food from them. However, this does not apply to all cat breeds as each has its personality. You know your cat better and should be able to determine whether she will try to break the feeder. For example, if your cat knows how to manipulate things in general or open doors, you should protect your automatic feeder. Make sure the automatic cat breeder you are buying is foolproof for versatile and smart cats. 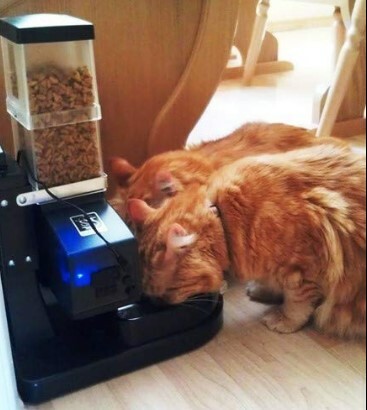 You can rely on automatic feeders to dispense food to your cat when you are away from home. Therefore, it makes sense to buy one when going on a trip. However, for your cat to get used to the automatic solution, she will have to go through a learning curve. The same also applies to you. As you use the feeder, you will learn some of its failures and how they can be fixed. Apart from this, you will know how your cat behaves with the feeder. The learning process takes longer than just a few days. Sometimes, it will take weeks for your cat to learn when the feeder dispenses food and get used to it. The batteries may not last long as you expect and hence the unit may stop working. If the feeder works with an AC adapter, your cat might unplug it when walking around. If you have not read the programming instructions well, the feeder may jump one or more feeding cycles. Things may go smoothly during the first week. However, in the coming weeks, your cat may break into the feeder and try to get all the food out at once. The above are some of the incidents that can happen when you are still new with the automatic pet feeder. Automatic cat food dispensers perform differently depending on the pellet sizes. You should know the pellet size that the feeder you want to buy can dissipate. For example, if you feed your cat small pellet size (1/4” diameter) and want her to eat small portions, make sure the feeder can dissipate that amount. Feeders designed with a roller and baffle system work well with small kibbles. The system allows the feeder to push out small amounts of food at a time. If you would like a feeder that dispenses big pellet sizes (1/2” diameter), look for those that work with a screw system. Check the warranty of the cat food dispenser you want to buy. Make sure the brand you are buying comes with at least one year warranty. Also, if you will be leaving home for a trip, ask a friend to check your cat every day just to make sure things are okay. Below is an overview of the best cat feeders on the market. If you are looking for a programmable cat feeder, the PetSafe Healthy automatic cat feeder is a great choice. 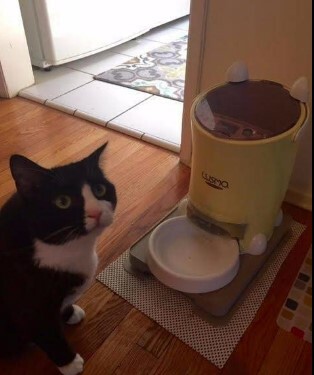 With this unit, you can customize the amount of food serving you would like your cats to have and schedule them properly. 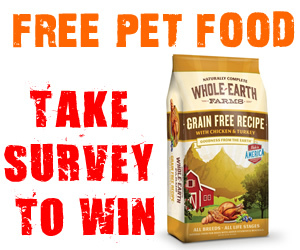 This means you can limit your cat’s food intake if you wish. 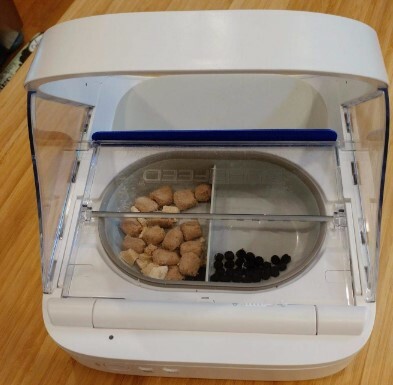 A portion-control system operates the electronics of the PetSafe Health feeder. This system features a conveyor belt that can reduce the food portions, from 4 cups to about 1/8 cup. 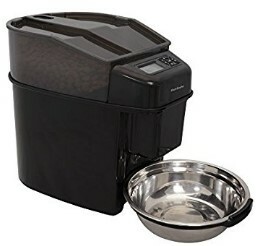 The unit can also be used to dispense wet or moist cat food. You can program the automatic cat feeder for 12 easting cycles every day. SureFeed is a high tech automatic cat feeder that uses a microchip to verify your feline pet and give them the proper food serving based on your program. This cheap automatic cat feeder work with RFID technology. 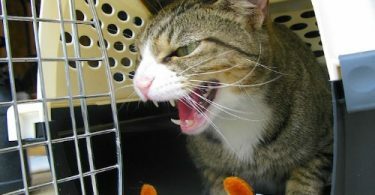 The feeder’s chip is implanted on your cat’s collar tag. When your cat comes close to the feeder, the sensor will recognize the microchip and open the feeder’s lid, allowing your cat to have access to the food. 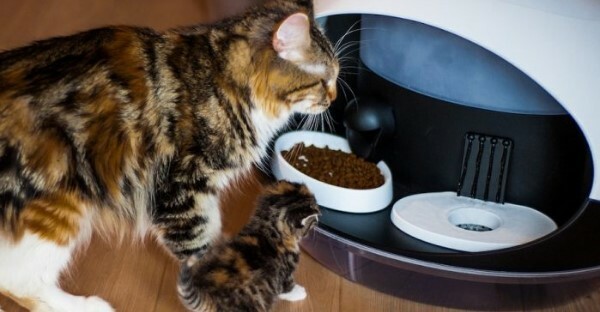 The automatic cat food dispenser can track up to 32 pets. This is the best automatic cat feeder for multiple cats or cats with special dietary needs. With the CSF-3 Feeder, you can feed your cat using the same or different bowls, allowing your feline friends to eat their meals in separate bowls to avoid bugging each other. 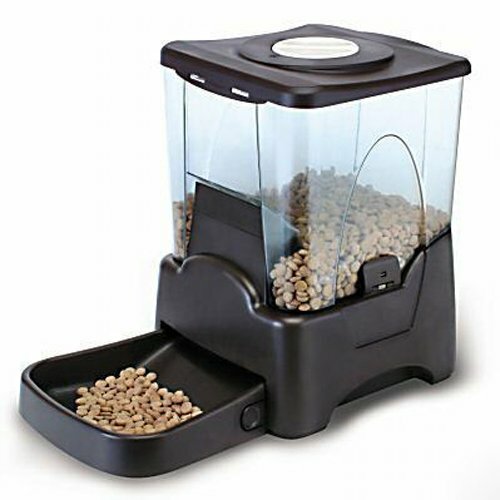 This cat feeder has a Super Feeder option for dispensing food. You can also automate the feeding process in different amounts. The feeder reduces the amounts from less than one cup to some cups of food daily. The feeder has a digital timer that you can program for different feeding cycles. The attractive and portable LUSMO Pet Feeder is easy to program for your pet’s specific needs. You can program up to three meals, each with separate portions. The automatic cat feeder is colorful and has a 24-hour LCD monitoring clock. 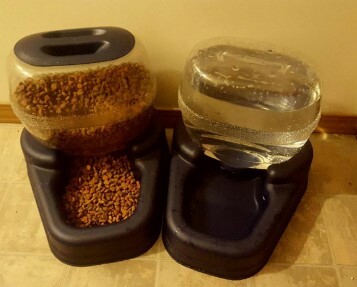 If you are a busy cat owner, this may be the best cat feeder for you. This durable and stable Bergan automatic cat feeder for multiple cats stands out with its water combo. The feeder does not use timers. Instead, it uses gravity to dispense food. This is the cheapest automatic feeder that we recommend. This feeder is an excellent option if you have pets that have strict dietary requirements or have multiple cats. All the cat food dispenser above great, are made of solid materials and can be used to feed multiple cats. We especially love the PetSmart Health cat feeder for its large capacity (can hold up to 24 cups of food) and customizable meal plans (you can program up to 12 meals). 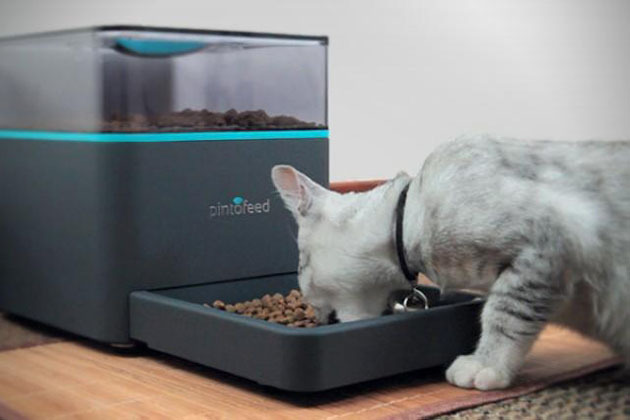 The cat feeder can dispense flexible portions based on how much you would want your cat to eat and is easy to clean.